In Part 2 of this article series, we saw how to quickly pair the Z-Wave section of this controller with your Z-wave hub. This article discusses the procedure for pairing your blind and shade controller with your WiFi network. If you haven't yet assigned your radio motors to the transmitter, please see Part 1A: Cloning Motor Channels that explains how to do this. If you have successfully activated the default Z-Wave mode and wish to explore the WiFi mode, please press and hold Switch 3 (long press) to re-start the controller in WiFi mode (please see Part 2 for location of Switch 3). You will be able to re-start the unit in Z-Wave mode later by changing a setting in the browser display. This unit also has an OLED display built into it that may help prompt you through the process. To expose the OLED display, you can view it simply by removing the 4 corner screws that hold the cover on. However, it is not necessary to use the OLED, as the unit will automatically start the web server and display a web page that you can connect to for further instructions. The web server starts out in AP (Access Point) mode, broadcasting a signal that will make it appear in your WiFi network selection menu. The WiFi list will also typically display your neighbor's routers too; this picture shows what the WiFi selection list looks like on a Linux laptop (we use Ubuntu Linux). Mac and Windows machines will have similar "pick lists", as do Android and IOS on mobile units. 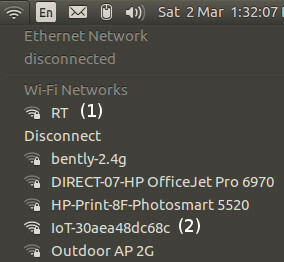 On the picture we have marked our existing network (1) that needs to be disconnected (it is called "RT"); your system will display your WiFi network name (SSID). Please note that you will need to know your password. We have also marked the controller ID as (2), which you will connect to temporarily so that you can enter the ID and password of your regular WiFi network. Please note that while in AP mode, the controller ID always starts with "IoT-" followed by the unique Chip ID. The OLED screen will also display this message on the screen, prompting you to connect your WiFi to the AP (Access Point) mode of the controller. It may take up to a minute for the SSID to show up in your list of networks, but if you disconnect from your current WiFi it will show up faster (the disconnect prompts a refresh of the available WiFi network list). If you enter the password, your system should connect to the controller, displaying the access point as the current connection in the WiFi pick list. The microprocessor will have already scanned the local WiFi radio wave emissions to generate a list of WiFi access points, and this information will appear in the dropdown selector that you see as the first item on the above WiFi config page. Your regular WiFi network will likely be the default that is displayed, because the system sorts by signal strength. When it starts up again, the controller will attempt to connect to your specified network in 'Station' mode. This is normally a very fast sequence, less than a second, and the OLED display should also indicate that you are successfully connected to your WiFi network (pictured). The controller will also detect and display the new IP address that the DHCP system in your router assigned to it. The software will then begin a 30 second period to allow your laptop (or other device) to disconnect from the temporary Access Point (AP) mode and re-connect to your regular WiFi signal, with the newly assigned IP address. Please note: If you enter the wrong password, or pick the wrong network, the unit will cycle back to AP mode so that you can try again. Please allow up to a minute for the system to be re-set, then follow the instructions above (Connecting to Your Temporary AP (Access Point) Mode). The DHCP system built into your WiFi router automatically assigns a local IP address anytime you connect a device to your WiFi network, whether it is a tablet, laptop, phone, or our controller. Typical home routers can issue up to about 250 different local IP addresses. Please Note: this is not the same as your public IP address, which is assigned by your Internet service provider. The DHCP system will not always assign the same IP address to your unit. When a unit like our controller has a built-in web server, it is a good idea to bypass the DHCP system and assign a local static IP address, so that it will always be available at the same IP address, and you can bookmark your controller in your local browser. Many routers also allow you to change the "hostname" to something like "Blinds 1", so that you can distinguish between controllers by name and IP address, when you review the list of devices connected to your WiFi router, in the router administration. 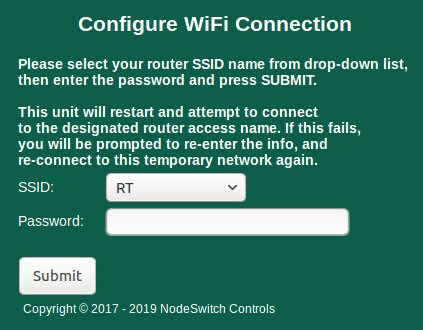 You will need know how to login to the administrative section of your router to do this, and although it is generally similar, the process will vary from manufacturer to manufacturer. For more instructions, please search the internet for your router model number, or consult your WiFi router user manual. If you have entered incorrect WiFi connection information, or the device cannot connect (for whatever reason), the controller will make 30 attemps to connect (in case you happened to cycle power on your WiFi router) before it gives up. It will timeout at that point and reboot, bringing up the WiFi config screen again. It will continue this loop procedure until you input the correct configuration settings. This unit uses a powerful microprocessor that can be re-booted, if you need to do this for whatever reason. It is not normally necessary, so it should be used with care. It does the same thing as unplugging the controller unit from the 24v DC power.